What it is: traps, such as ‘gin traps’ which clamp an animal’s leg (or head) and hold them in place until the trapper checks the trap, the animal is killed by exposure / predators or chews off its leg to escape. Gin traps are generally believed to have been so-called as many mechanical devices were referred to as ‘engines’ for a long time. 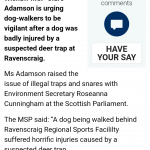 Originally developed (‘man traps’) to protect estates from poachers… (til the 1820s). Legality: OUTLAWED in England and Wales since the ‘Pest Act 1954’ – not considered to be ‘humane’ due to being indiscriminate as to animals caught and their capability of catching a wide range of non-target animals, including protected species. 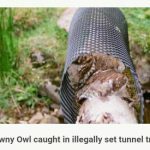 Who uses them: no one legally, but they are still found around the countryside now and then – sometimes atop poles where gamekeepers can catch birds of prey near pheasant pens and so on. Where they are found: most likely to be on shooting estates and by pheasant pens. Target animals: they are made in varying sizes to target different animals – the smallest variation we know of is a ‘kingfisher trap’, placed on branches of trees by waterways. Generally used in the UK to catch medium-sized mammals such as foxes and cats and smaller mammals such as weasels, stoats, rats, rabbits and grey squirrels. How they work: the normal design is a pressure (treadle) plate that is stepped on or has pressure placed on it in some way and which releases a mechanism which snaps the jaws / sides shut. This can either hold an animal in place or strangle them or break their neck / back or limbs, etc. 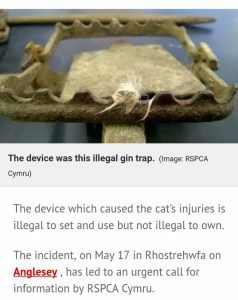 When the gin trap was outlawed, new methods emerged to ‘control’ those animals seen as pests / vermin. Snaring and the development of lamps for shooting at night (‘lamping’) became more commonplace. The ‘Fenn humane trap’* was introduced in the 1950s. Legality: legal to use if placed in a suitable tunnel (see picture above) to minimise risk of non-target animals being caught and prevent larger animals from triggering the trap. The use of further physical excluders, such as sticks at the entrance, is discretionary. 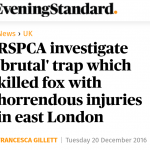 Fenn are currently legal, though may be taken off the ‘approved’ list by DEFRA in the future to be replaced by newer designs… traps must be approved by DEFRA in order to be legal. 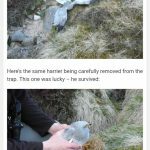 Who uses them: Fenn traps are a “standard tool for gamekeepers” (GWCT) but can be, and are, used by other people for a number of reasons. Where they are found: often around shooting estates where gamekeepers want to kill anything that may take gamebirds or their eggs. They may be placed on tunnels on branches, on top of fence railings, under rocks in the corners of fields or in vertical or L-shaped tubes on trees or vertical posts. 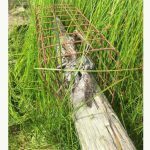 Some traps are designed within a tunnel but most Fenn traps found are placed within homemade tunnels, meaning they can easily be used (illegally) without them… on top of poles, as described above, or on the ground covered with a few leaves or some dirt as a disguise. Target animals: usually grey squirrels, rats, weasels, stoats… birds of prey may also be targeted. How they work: the trap consists of a ‘treadle plate’ which triggers the mechanism when stepped on or nudged hard enough by an animal. 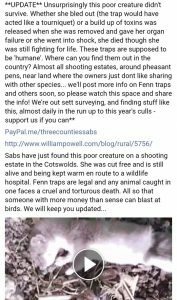 In July 2017 a member of Three Counties Hunt Sabs found a seriously injured weasel in a trap. 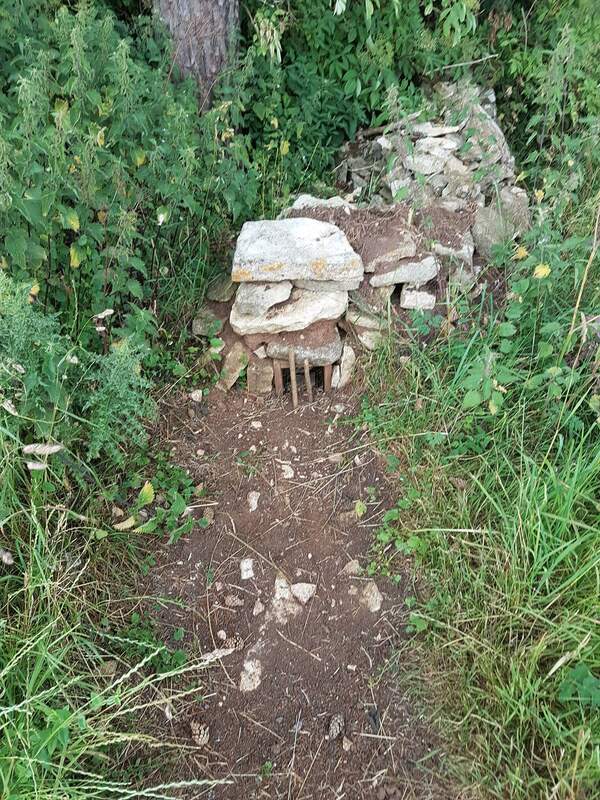 The area, Calmsden, has been the locating of numerous blocked / destroyed badger setts, some found with concrete blocks shoved into the entrances. 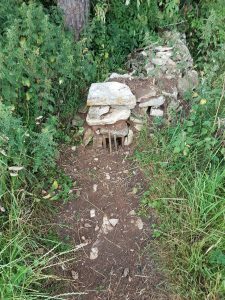 Various sett-surveyors and hunt monitors have commented that the area (alongside various areas in the Cotswolds) seems devoid of wildlife. 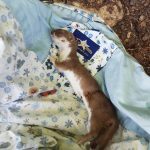 Despite being set up ‘correctly’ the trap had not instantly killed the weasel and she had potentially already suffered for hours – with the trap also acting like a tournique, she could easily have survived, suffering, for hours longer. How you can help: if you find any traps whilst out in the fields, check to see if there’s a brand name on them. Are they in a tunnel or atop a post or hidden on the ground? Are there any suffering animals trapped? Or any dead non-target animals? If within the three counties (Worcestershire, Herefordshire, Gloucestershire) give us a shout – we may already be looking at similar things in the location you’re in (though hopefully we / GBO will know that you’re sett-surveying or checking in the area). 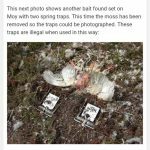 If you suspect illegal activity regarding birds, the RSPB are very interested in illegal raptor traps and incidents where birds of prey are targeted. Local wildlife officers are often also interested and may be an option. 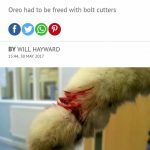 Check out our advice re injured animals found in traps in case you find live animals, but if you do need to cut the trap you would need to make a couple of cuts either to the spring mechanism or to the metal bars which snap shut. If you need to remove the entire trap they are usually staked into the ground by a chain and easy enough to pull out whole. Some are attached more securely and the chain would need to be cut. Be careful if checking traps for brand name / injured animals in case they haven’t tripped – they can hurt a lot and potentially break bones if they catch your hand or fingers! Some are more sensitive than others but it’s always best to use something like a sturdy stick if handling them as pressure on the plate should set them off. If a trap is believed to be illegal it can be made safe by tripping it (using a sturdy stick for example) or by standing in it and pushing the jaws together until they unhook from each other (which releases the tension needed to trap an animal). 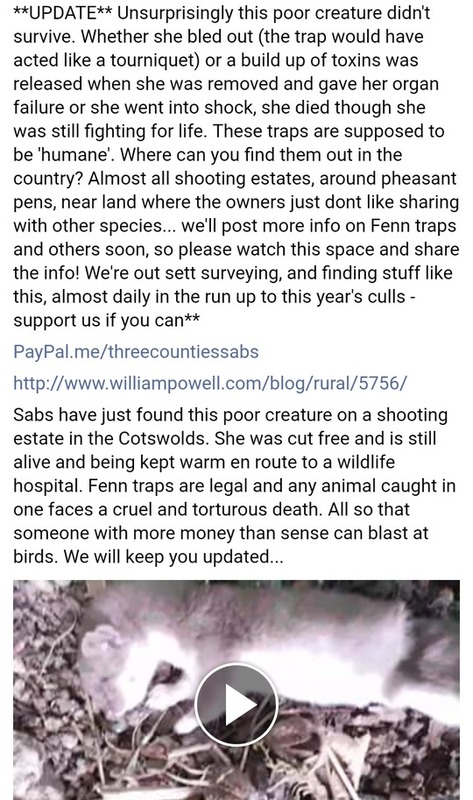 You should consider that this may alert operators to the fact they’ve been found and putting up a trail camera or having police / RSPB investigate may have a bigger impact. You should also remember that there are likely to be other traps nearby!